I was born in the Memorial Hospital in Evanston. Yup, the first twin ever born there. It’s my claim to fame. From what I understand from my mother, she was as big as a cow with the two of us. 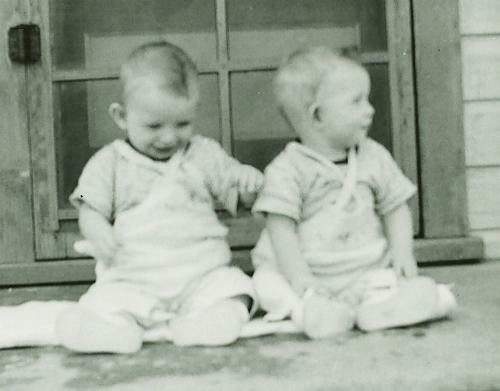 We were both big, for twins — nearly six and a half pounds each. She said when she sat down, her stomach covered her knees. We all know that at just under five feet, it wouldn’t have been that hard to do. I swear her thighs were only about sixteen inches long. 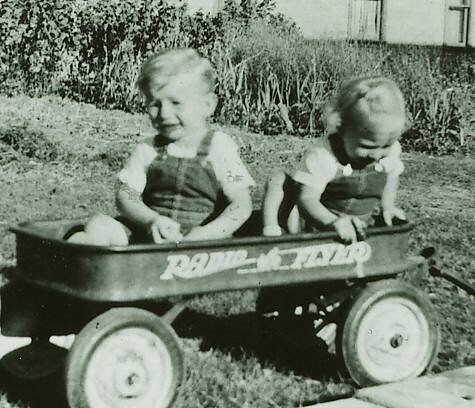 Eileen was born less than two years later and Rob followed in another two years. So we had four babies under four years old. My earliest memory is being in the crib upstairs with David. Every time I told my mother that, she would get hysterical. She’d say, “My gosh, you really remember that? That was before you were two years old!” I’d tell her exactly where the crib was, how there was a slanted ceiling right over us, how it was right next to the banister and how crowded it was in there with two toddlers. That’s a pretty vivid memory if you ask me! She told me that I would drink David’s bottle and then sit on him and drink his bottle too. And he would howl like crazy. I don’t remember doing anything like that. I do remember her telling everyone in the world the story, even when I was a teenager. Whatever! My next memory is being in the sandbox out by the back fence near the carport. Evidently little girls were supposed to be fully dressed when they played outside. I remember getting my behind smacked all the way into the house. I also remember getting up on the roof of Charlie’s garage across the alley from our house. I had a dress on that day, and I still got paddled. Evidently little girls don’t climb up on the neighbor’s garage in a dress. I broke my collarbone when I was about three or four. Although I don’t remember it, mom told me I had been jumping on the bed in the upstairs front bedroom and fell off. They put my upper arms and shoulders in a type of harness causing a permanent shoulder shrug up near my ears. I also remember sneaking downstairs during nap time to crawl under the kitchen table and lying on the chairs at the back near the wall where I thought I was invisible. Mom would be cleaning up lunch and whistling some cheerful song. She’d sing right in the middle of a song, “Little Miss, you’d better get your behind up those stairs and get to sleep.” And, I thought she didn’t know I was there. Although I have no clue how old I was at this next memory, I remember playing all summer [it was probably only a couple of days . . .] in the big hole in the back yard. We played “army” and “cowboys and Indians”. When I recall this fun summer I can’t help but still be amazed that mom let us get so dirty every day. We burrowed down in the hole for hours at a time. We had lunch down there, made secret plans and then carried them out. I’m sure dad was fixing a pipe or putting a new one in, or something like that. Other summer memories include eating all the raspberries and peas from the garden, always having rhubarb with sugar on it, and finding tons of strawberries and tiny little carrots. For some reason I thought I was getting away with eating all those, but now that I’ve been a mother, I know mom knew exactly what I was doing. At the end of summer we canned from the garden for at least a whole month. Dad bought pears and peaches and tomatoes but we grew a lot of our own things. We had a cellar and filled it up every year. All of that canning every single night after school is probably the very reason I have no desire to ever can or preserve anything for the rest of my life. OK, maybe this pictures disproves many of my theories. I don’t have the same clothes on as David and my dad IS holding me. Of course I can’t mention summer without mentioning camping. I believe we camped every year of our lives. I don’t remember each one individually, but I remember the general feelings I had. It was Wonderful! Mom packed up most everything in the entire house for a couple of days and dad loaded it all. We had a huge canvas army tent and bedrolls. Mom cooked there, just like she did at home and we had amazing meals. I have absolutely no negative or sad memories of camping. We played games and sang and fished and hiked. I know we went to the Grey’s River, Ham’s Fork, Stillwater, Mirror Lake, Bear Lake, Christmas Meadows, Bridger Lake, State Line, Cottonwood Lake, Marsh Lake, China Meadows, and probably others. We went to Green River Lakes, which started a whole life-long obsession with camping. I remember one summer we didn’t do our regular camping vacation but instead went to most/all of the LDS temples in the north west. It was a great vacation as well. In the first grade Mrs. Proffit was my teacher and my favorite memory was milk and nap time. Each child had a little mat from home and after we drank a small carton of milk, we all laid down for about thirty minutes while Mrs. Proffit read a book to us. It was the best part of the day. I also remember, of course, loving recess and playing on the huge swing set. 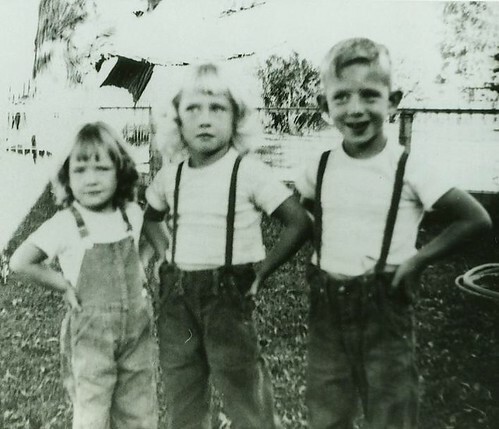 The girls wore dresses to school in those days, so we had to be very proper and not show our underwear. Second grade was governed by Mrs. Angwin, and I do mean governed. She had a reputation for being tough and stern. Her face looked grumpy. The only memory that really sticks out in that grade was finding out about Santa one day. I ran into the bathroom and cried for a long time. I was so angry that someone told me but then I spent a lot of time telling other children in the same cruel way that I had heard it for the first time. It was the first time I remember being mean. I started having ‘best friends’ in the second grade and was so hurt that my ‘very best friend in the whole world’ ruined my life by telling me that. Learning came easy to me. I loved writing, spelling, arithmetic and reading. I was always a good student and loved getting all “S’s” on my report card. Later I took great pride in having perfectly formed cursive. I spend hours writing all the loopy letters and connecting them with a flair. Today I hate my writing. I have mastered a sort of connected-printed form of script. In third grade there was some kind of secret going on. All the adults knew but none of us kids did. We had a teacher for about six weeks and then she disappeared and we had a new one. None of the kids could understand what was going on but I remember seeing a lot of adults with knowing glances and a whole lot of people stopped talking when I’d come into the room. I don’t know what it was but it marked me for life! I honestly don’t remember either of those teacher’s names, which is odd, because I do remember pretty much everything else. [Miss Barker? Maybe?] On April 1st in the third grade, David and I went home for lunch [Mom wasn’t home that day and had left lunch on the kitchen table] and decided to exchange clothing to try to “fool” everyone. We thought it was such a fun idea. He wore my clothes plus a head scarf. I wore his plus a hat. I’m pretty sure now we didn’t fool anyone, but we thought we had at the time. Once, again, from my grown-up perspective as a mother, I know that every adult knew exactly what was going on. I remember getting in trouble for not answering the teacher when she called on me, insisting that I was David, not Dorothy! I think this was the year my cousin, Kathy, came to live with us. I still don’t know why she did but I do remember that my parents loved her like their own. She was a grade behind me and I had my own friends [Shellie Staley was by best-best!] so I remember feeling confused and not being so nice to her. It was a little odd having another person in our family but it was completely normal at the same time. She was always my favorite cousin but I remember feeling perplexed at this time of our lives. In those days adults kept many things hush-hush. They didn’t share information with kids and the saying, “Kids should be seen and not heard” was popular. We walked to Primary on Thursdays after school. There were no school buses back then and the church was only about a half mile away. I became more aware of new friends who didn’t live right on our block. Bonnie Crompton and Peggy Keyes were two of them. Some of my favorite Primary teachers were Glenna Stonebraker and Ann Pennington. I also loved my piano teacher May Burleigh. I loved calling her Mabel Early . . . combining her names and then dividing them where I thought was cute. We got a phone about that time and we had a “party line.” The Staleys were on our line with us. Our number was 243W and theirs was 243M. We also had an operator who said, “Number, please,” when we wanted to call someone. I remember being told all the time that my turn was up! With ten people in the house we didn’t get much phone time. Mom was our 4-H teacher and all of us learned to sew and cook. She was great at both! We ‘volunteered’ her to make cookies or a cake for lots of events. And she helped us make the most amazing Valentine boxes. We were all used to getting “first place” every year. She could cook anything from scratch and had lots of recipes that people loved getting for their own collections. Most of them had measurements like a pinch of this or a speck of that or just a little bit. She was fairly famous for starting over a recipe that didn’t turn out like she wanted. For instance, if a cake didn’t turn out just right, she’d break it up and soak it with a cup or so of milk and add a few more things, re-cook it, and voila! Perfection. 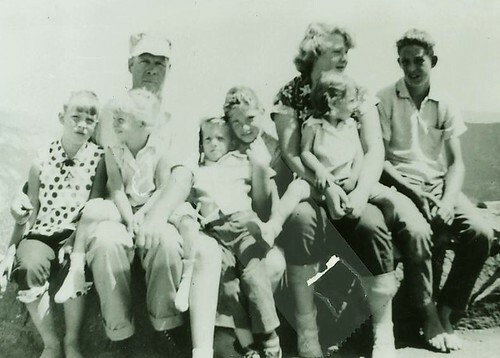 My memories of dad are that he was hard working, sweaty, grumpy, loved the Gospel, read his scriptures, punished us a lot [spanked the whole lot of us with a wooden board when one of us wouldn’t confess something.] He was an engineer for the Union Pacific Rail Road and had a very odd schedule. He’d work — and be gone — for two or three days in a row and then be off for two or three days. He’d always blow the train whistle when he passed our home! He could stretch a dollar around the block. He was thrifty and careful with money and was a good provider for our family. He helped most of us with college and buying our first car. He loved to camp, hike, Scouts, his family, watching over the neighborhood and taking care of the church building. He was honorable and honest and trustworthy. He went the extra mile in so many areas, [he build a huge ice skating rink for the neighborhood and bought 50 pair of skates from DI so he could rent them to the kids in the neighborhood for a dime or a quarter and was also instrumental in getting a nice park and playground built near our home] but I remember feeling quite abandoned by him. He was so busy helping everyone else that I constantly felt quite invisible to him. One of my very saddest and most disappointing memories is that one year dad left my birthday party and took another cake to another family in the ward so that they could celebrate their birthday. It was probably a family without a dad or the means to have a cake. Mom says he loved me . . . adored me . . . but I can’t say I ever felt it. I do remember if I ever needed anything and he was not around, he’d say, “Just tell them you’re Claude Smith’s daughter and someone will help you.” He was right about that. That’s through the third grade and it’s all I can write today. I should say that I thought my young life was pretty fun except that my general impression was one of David getting away with pretty much everything and me, not so much. I know I started resenting him pretty early in life. One day we ‘accidentally’ started a fire in the upstairs closet when mom was having “Hen Club.” Dad came racing upstairs to see what we were all screaming about and David ran and got in bed. He closed his eyes and softly “snored.” I got the daylights beat out of me but I remember David getting away with it. I also resented wearing all the same clothes. Mom made most of the clothing that all nine of us wore and I always had to be dressed like a twin. The other girls got to wear pretty, flowered fabric. Me? Plaid. Ugh! Now, when people ask me how it was being a twin . . . I honestly inwardly groan at the thought of explaining why it wasn’t all that great. Oh, wait. Another memory. 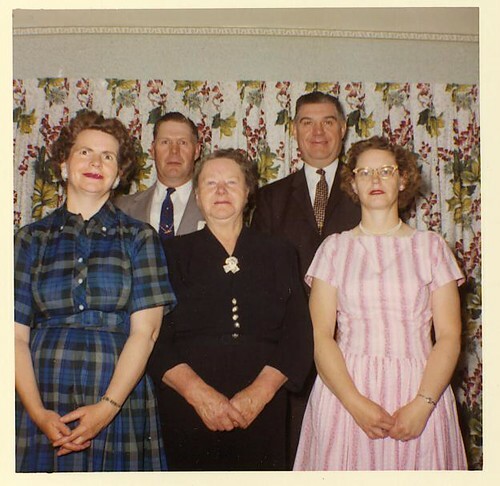 Dad’s mother lived next door and three unmarried aunts lived across the street. 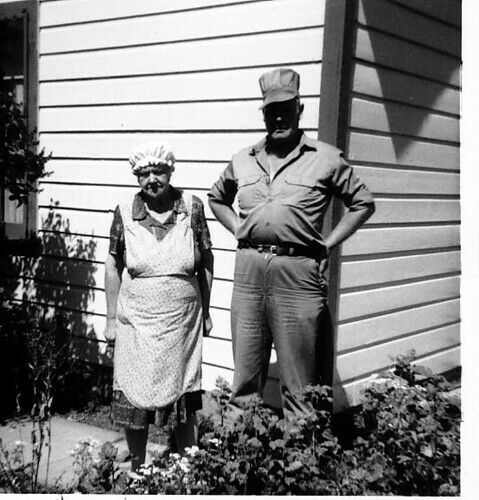 Grandma was Sarah Ellen Gerrard Smith. Her unmarried sisters were Violet, Suzanna [I called her Aunt Orange for some reason] and Alice. Dad did all the work involved with supporting and caring for them. He mowed their lawns, sprayed for bugs, helped with gardens and repairs, shoveled sidewalks, and did a lot of their shopping, although I do remember Grandma and Auntie Violet often walking to town to shop. They would don their sturdy leather shoes and warm, calf-length black wool overcoats and walk, rain or shine, to the IGA or Safeway for a week’s groceries. They wanted to be independent, even though they were quite dependent on Mom and Dad. I remember they would occasionally come over to our house for Family Home Evening and we pretty much drove them crazy. If I had a dollar for every time I heard “Don’t cross your eyes or your face might freeze like that,” . . . well, I’d have about $50.00! 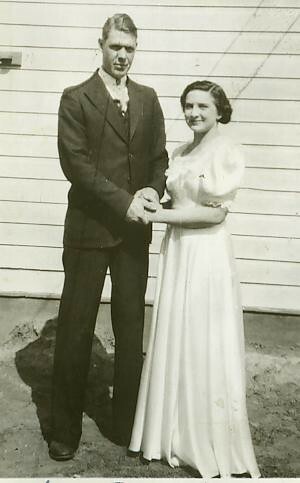 Grandma Smith taught Gospel Doctrine for at least 20 years. They were all devoted to the gospel of Jesus Christ and tried to live Christian lives. I feel bad that their lives were not full of love and companionship from a loving mate. Please help me with my spelling, punctuation and grammar. I might print this off someday . . .
Love this…there is a TON I didn’t know. Please, please, please keep writing. What on earth did you do that Grandma blamed her swearing on? A ton? We were doing laundry and in the back porch. I really can’t remember other than it had to do with some sheets. She said the S word and then said I was the only grandchild who ever made her swear. Weird, huh!